"This is an awesome treat for the grill. We raise grass-fed lambs that are weaned naturally. Experimenting with lamb recipes over the past 15 years has become a hobby. Lamb and garlic go so well together. 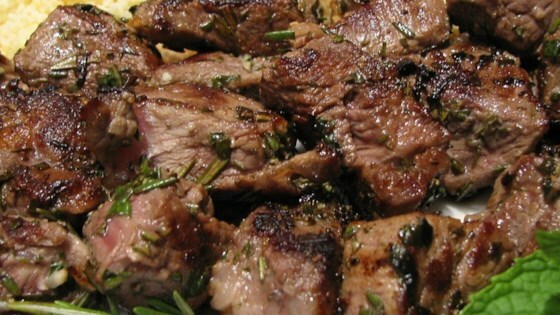 In this recipe, the combination of herbs and spices complement this meat and make a great family-and-friend favorite." Place lamb in a large bowl. In a separate bowl, stir together mustard, vinegar, olive oil, salt, pepper, rosemary, sage, and garlic. Pour over lamb, and mix to coat meat. Cover, and refrigerate overnight. Preheat outdoor grill for direct heat. Add marinated lamb, fruit, and vegetables to stainless steel or bamboo skewers. Reserve some of the juice from pineapple chunks and cherries. In a small bowl, stir together melted butter and splashes of juice from the pineapples and cherries to create a basting sauce. Place skewers on preheated grill, and cook about 12 minutes, turning and brushing with butter sauce. Excellent mariade. Easy and flavorful. I didn't even watch the proportions-- just threw together in a plastic bag, dropped in meat and let sit overnight. Delicious marinade. We used new potatoes instead of cherries and mushrooms and that was very good too. This marinade is awesome! I used it on a couple pieces of lamb shoulder instead of doing kabobs and it was amazing. The husband and I both enjoyed it. Good marinade and flavors. I didn't use the cherries but I did use the pineapple. Will make again. Delicious marinade! Thanks for sharing. Used it on both lamb and chicken kabobs. Omitted the pineapple & maraschino cherries since didn't have them, and also the butter.